RPS-300 Controller With Remote Sensing Head - Deeter Electronics Ltd. RPS-300 Controller With Remote Sensing Head - Deeter Electronics Ltd. 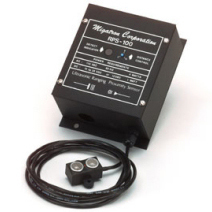 The RPS-300 is a high frequency, sealed transducer unit best suited for environments where dirt and moisture are a problem. The transducer heads are made of Delrin with epoxy face for the 14" and 36" sensors and Valox with a silicon face for the 72". The remote transducer allows for mounting of the sensor head in cramped spaces while the controller is out of the way. The ranging and proximity modes provide the versatility of simple detection, or actual distance measuring. The isolated form C relay furnishes N.O. and N.C. outputs, and with the addition of the RPS-500 card various analog outputs are supplied. 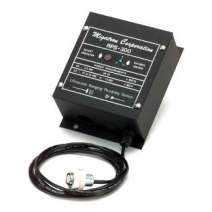 The RPS-300 sensor operates at a frequency of 222kHz for the 14" and 36" ranges and 150kHz for the 72" range. This sensor has a narrow sensing beam. Sensing ranges available for the RPS-300 include 4" to 14", 5" to 36", and 8" to 72". Mounting flanges, LED indicator, ranging potentiometer and 6-ft. transducer cable are included. Optional cable lengths are available. Proximity detection is the detection of an object in a given range. The detection range of the RPS-300 is controlled by the "Range Control" potentiometer located on the front cover of the controller. Any object within the desired range is detected, while objects out of range are ignored. The detect point is independent of size, material, and reflectivity. The Proximity Option is denoted by the part number RPS-300-14. Operational Range: Adjustable 4" to 14"
Transducer Frequency: 222 kHz for 14" and 36"
Response Time: 4" to 14" 5" to 36" 8" to 72"
*Dimension changes from 2.5" to 3.75"when ordered with the 500 Analog Ranging card. **Transducer Diameter changes to 30mm when ordered with the Teflon face or in the 72" range.